Only missing a little aluminum work at this point. There's the R9 Nano hooked into the pcie cable I made for it. I added a separator in the middle of the system to control airflow. 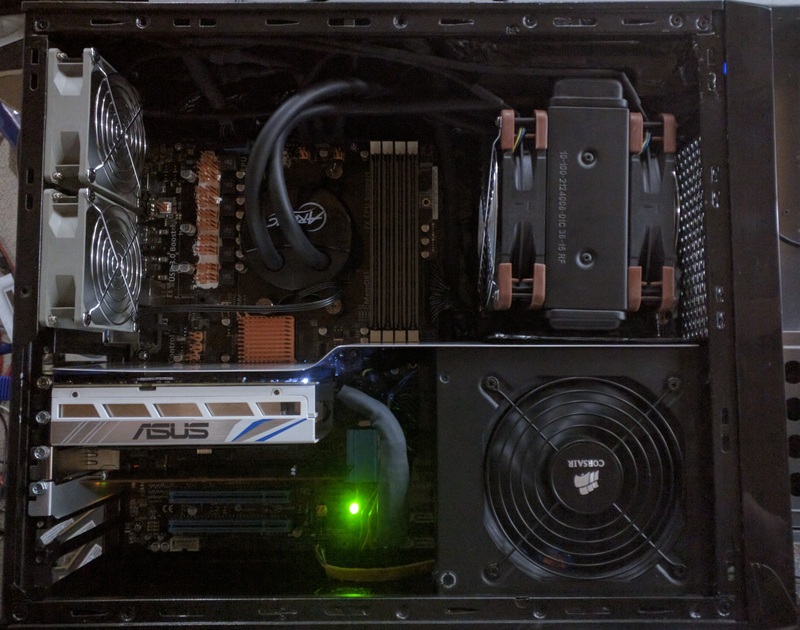 I didn't capture it well in the photos, but I did a lot of custom cabling for this. Every PSU cable is coated in layers of frog tape, copper leaf, more frog tape (to prevent corrosion) and finished off with heatshrink tubing so I could form the cables to fit where I needed them to. They fit snugly and precisely in what little free space there is in the case. 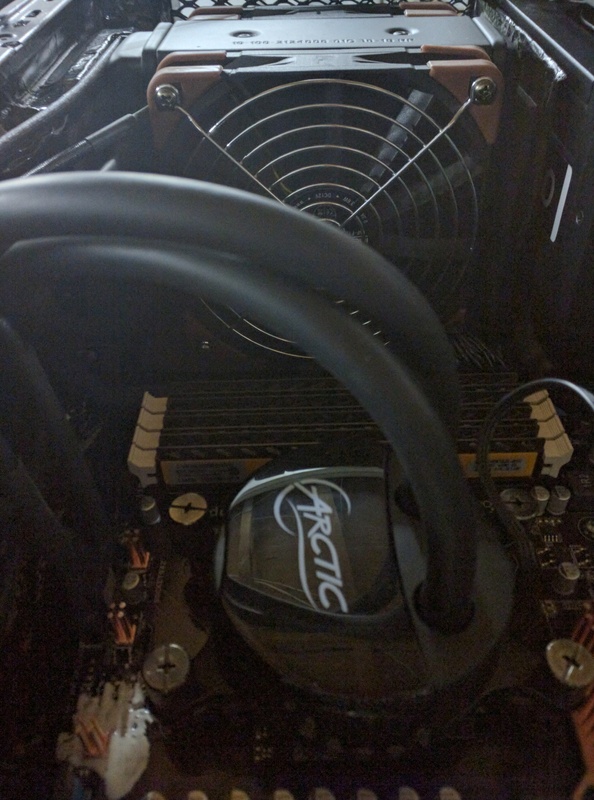 Close up of the Arctic Liquid Freezer 120, which completely changed how I feel about AIO solutions, I love this thing. I still don't sleep as easy as I would with air cooling, but I'm impressed so far. 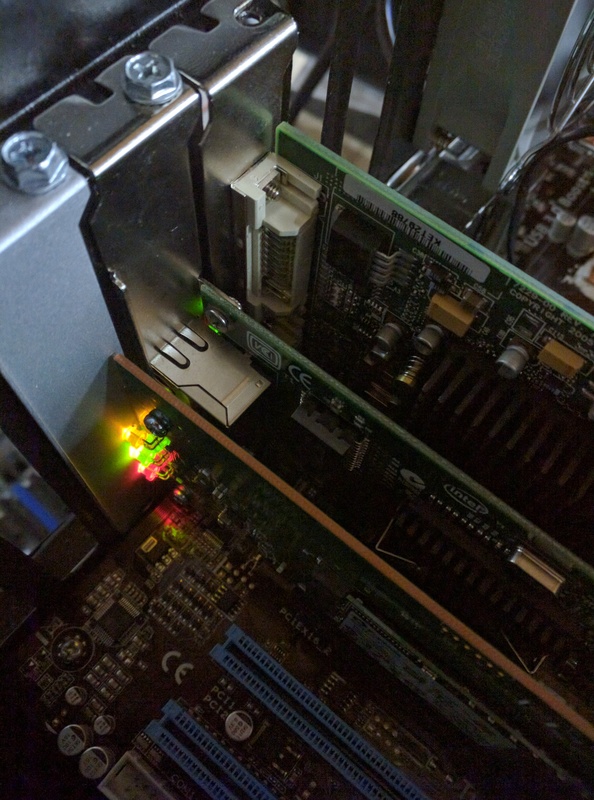 Christmas lights provided with the plextor 128gb pcie ssd, HDR made them look kinda cool. Also pictured is my Intel NIC and Matrox G550, still testing basic console output at this point. This was the original system, which was a mess. Outfitted with a T1100 and 16GB of ram strapped to a Radeon 7000. The purpose here was getting the most out of air cooling by creating a huge isolated tunnel with push-pull fans. 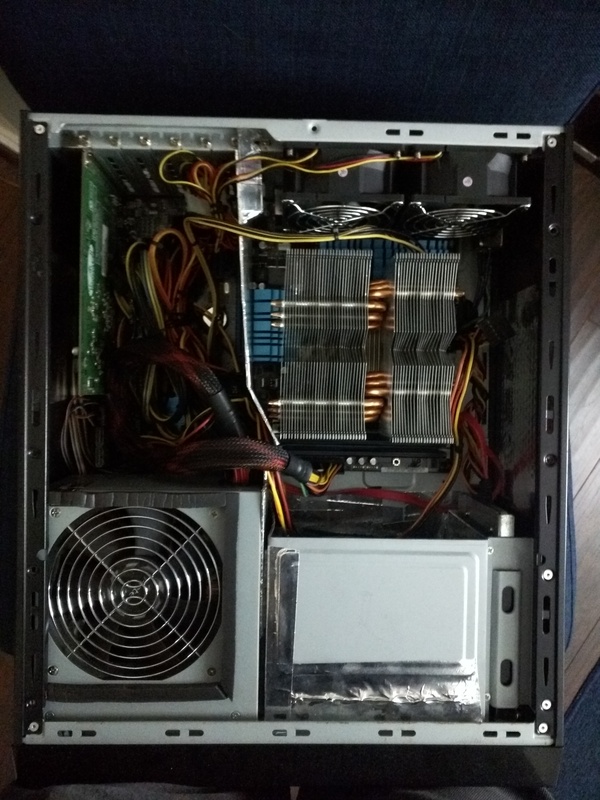 It worked really well, but I couldn't do any GPU development with it because the PSU had too many wires in the way, one upgrade led to another, the FX series chips came out and I ended up with the fully-renovated system you saw at the top of the thread. 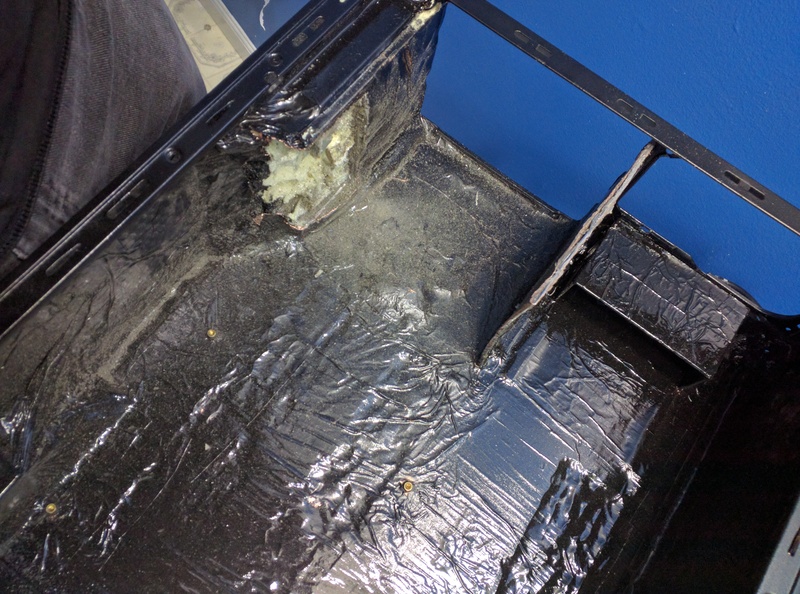 This was the underside of the case which only housed the main power cable, I filled this in with foam and sealed it off so that dust couldn't get trapped in the dead space. We live next to an airport and have a ton of wireless noise in our environment, so this was an attempt to improve grounding of EMI and other such signals through many layers of various metals, the copper leaf looked the most cool I think. I filled in some more dead-space with foam and re-wrapped and re-insulated them. I would switch off between copper leaf, aluminum, cold galvanizing compound and black epoxy high gloss spray. This should prevent any rusting, though it's far from a perfect solution. In the end, it produced good results though. You can see here I'm carving out space into the foam to make room for the Arctic Liquid Freezer 120 when air cooling is no-longer sufficient for my FX-8350. Here I had to drill down into the floor of the case to fix some bumps where the foam from the back-side had bled through and were forming very strange high-pressure bubbles months after I thought it had dried. I flattened it out with a dremel and re-coated everything. There's also more drilling for the Arctic Liquid Freezer 120 to have a snug, custom fit. One of the last major re-coats before I start doing more testing. This also shows off the completed drilled out area for the new cooler as well as the tape-web I put up to close off any more dust-traps. I also went through with epoxy putty and filled in as many cracks as I could, making the interior as smooth as possible. The idea being if I need to clean it out in the future, it'll be much easier. I wish I had a way to test how much noise it was blocking, but I figure it's got to be better than doing nothing. I used the same copper leaf that musicians use on guitars for the same purpose, so I figure if it works for them it should work just as well here. I tried to read up on it too and it turns out that active shielding is WAY more effective than passive shielding. 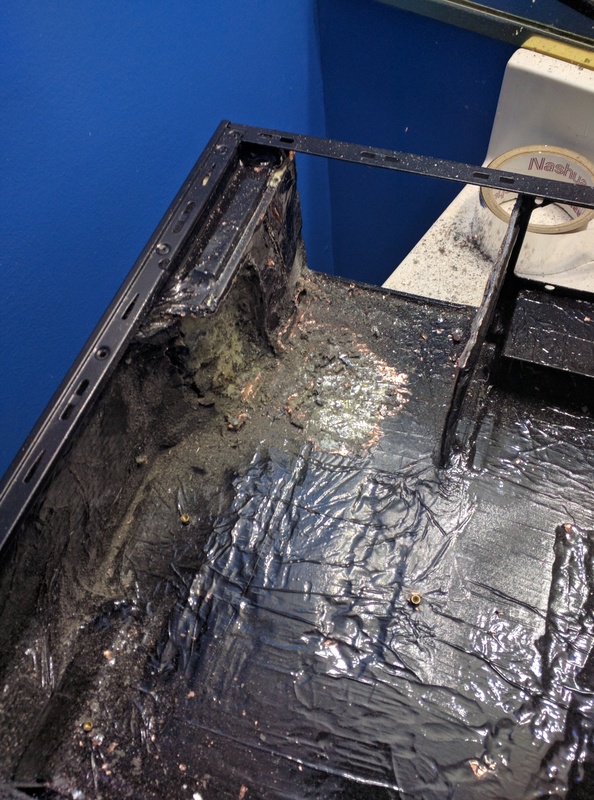 Where active shielding can always ground the excess energy away, and passive shielding is just like wrapping something in copper and isolating it from ground so the energy can't really go anywhere. In the latter case, you could reflect some EMI but it's nowhere near as good as reflection/absorption plus grounding. Here, the case is pretty well grounded, but I wasn't able to implement active shielding for the power cables. The other thing I did was to chop off the power plug the case came with and replace it with one that tries to clean input power up a little. Since I'm using an AX760, the power gets cleaned at least twice before it even hits the motherboard. I figured this would be vital in a machine that's always going to run at 4Ghz and a gpu that'll always run at 1Ghz. High frequency devices get drowned in signal noise, though they're generally pretty robust to it, I figured for this project that I'd try and make extra sure that the hardware isn't having to cope with so much noise. Hopefully this lends itself to greater stability, but again it's hard to prove or test. I think it's a reasonable assumption that it would have to help, though.